Cardiogenic shock is the inability to meet the metabolic needs due to severely impaired contractility of either ventricle. That leads to decreased tissue perfusion and a shock like state. Risk factor includes prior myocardial infarction, advanced age, female, diabetes, or anterior wall myocardial infarction. The most common cause of cardiogenic shock are acute Myocardial infarction, ventricular septal defect, acute mitral regurgitation, cardiac tamponade, aortic dissection, massive pulmonary infarct, and severe dysrhythmias. Pulmonary congestion and hypoxemia worsen as the ventricles fail to eject adequate volume and the blood backs up into the lung. Tissue hypoperfusion continues because the oxygen does not meet the metabolic needs. Restlessness progressing to unresponsiveness, and changes in level of consciousness. Nursing Diagnosis: Impaired gas exchange related to increased left ventricular diastolic pressure (LVEDP) and pulmonary edema associated with severe left ventricular (LV) dysfunction. Continuously monitor oxygenation status with pulse oximetry. Monitor for desaturation in response to nursing intervention. Monitor ECG for dysrhythmias caused by hypoxemia, electrolyte imbalances, or ventricular dysfunction. Obtain HR, RR, and BP every 15 minutes to evaluate the patient’s response to therapy and detect cardiopulmonary deterioration. Assess the patient’s respiratory status. The use of accessory muscles and inability to speak suggest worsening pulmonary congestion. Assess for excess fluid volume, which can further compromise myocardial function. Review ABGs for decreasing trend in Pao2 (hypoxemia) or pH (acidosis). 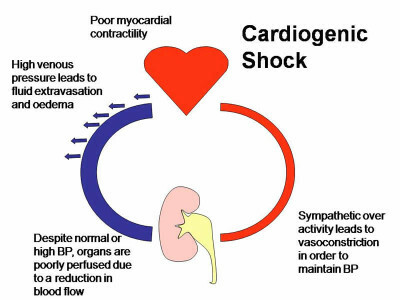 These conditions can adversely affect myocardial contractility. Review serial chest radiographs to evaluate the patient’s progress or a worsening lung condition. Provide supplemental oxygen as ordered. If the patient develops respiratory distress, be prepared for intubation and mechanical ventilation. Administer low-dose morphine sulfate as ordered to reduce preload in an attempt to decrease pulmonary congestion. Minimize oxygen demand by maintaining bed rest and decreasing anxiety, fever, and pain. Position the patient for maximum chest excursion and comfort. Administer diuretics and /or vasodilators as ordered to reduce circulating volume and decrease preload.